Are you looking for a men’s fragrance that will make a perfect use for evening wear? If your definition of an evening wear is something that is sweet and elegant, perhaps also slightly woody and spicy, then Mont Blanc Individuel is definitely what you are seeking. Mont Blanc Individuel is a fragrance for men that delivers a sweet and aromatic scent. It is premium and elegant. Mont Blanc Individuel will make you feel comfortable and confident with yourself, and the people around you will certainly also find you fresh and welcoming. Mont Blanc Individuel is produced by Mont Blanc, a German manufacturer of premium luxury goods and accessories. The company and the brand can be easily identified by the ‘White Snowflake’ logo, which has six corners and usually comes in a white-and-black monochrome color scheme. It was first founded in 1906, and since then, the company has spread its production to hundreds of boutiques all around the world. Mont Blanc is most well-known for the premium writing instruments, watches, also jewelry and leather goods. Mont Blanc has also produced its own line of perfumes, and one of the most popular ones is Mont Blanc Individuel. Mont Blanc Individuel was first released into the market in 2003, designed and crafted by the perfumer Pierre Bourdon. It quickly captured the attention of many people and has received lots of positive reviews since then. 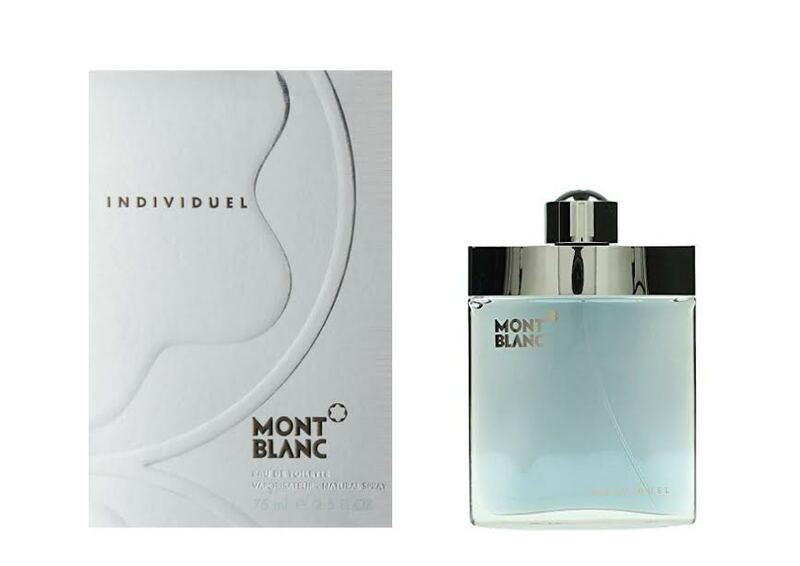 Men – and women – particularly like how Mont Blanc Individuel delivers such a pleasing, humble, nad friendly aroma. Mont Blanc Individuel comes in a stylish, graceful gray box. On the front side of the box, you can find the bottom-right quarter of the Mont Blanc logo embossed, covering most of the surface. The name Individuel is written in a Sans Serif font style near the top-left area, just at the center of the embossed logo. Opening the box, you can find the Mont Blanc Individuel in a squarish gray-colored bottle. The bottle is also translucent, so you can effortlessly see how much of the liquid inside remains. This is good; you can tell if the perfume is about to run out so that you can get another bottle before you actually run out of the scent. You can say that the simple yet elegant modern design of the packaging is speaking about the fragrance itself. Mont Blanc Individuel can be described as a sweet, aromatic scent, with woody and spicy characteristics. While the combinations of the notes are rather complex, the real smell itself is not. The fresh and gentle aroma of Mont Blanc Individuel makes it very flexible and versatile. You can certainly use it in daytime for almost any occasion, but Mont Blanc Individuel especially excels as an evening wear. It makes a perfect choice for semi-professional and casual purposes, and it is certainly great for going out with your significant other. Introduced in 2003.When applying any fragrance please consider that there are several factors which can affect the natural smell of your skin and, in turn, the way a scent smells on you. One of the best things about Mont Blanc Individuel is the confident, yet inoffensive sillage and projection. The sillage and projection are moderate but noticeable. The perfume is also quite long-lasting. More often than not, it lasts for hours, and it rarely needs a re-application unless you just went through a particularly long, busy day. Mont Blanc Individuel opens with a rather spicy and aromatic opening, as the top notes feature cinnamon, coriander, and cardamom. The top notes are further supported by lavender, pineapple, bergamot, and mint, giving some fresh and pleasant air. The citrus notes are prevalent in Mont Blanc Individuel to distinguish the perfume from another scent that may smell almost similar, Aventus Creed. The middle notes contain some floral scents. The base notes are solid and confident, providing the sweetness of vanilla and dark chocolate and also the warmth of sandalwood, amber, oakmoss, and musk. Check the best price for Mont Blanc Individuel here!